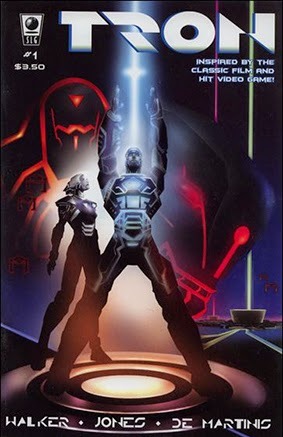 • PLOT SUMMARY: Inspired by Tron, Disney's groundbreaking science-fiction motion picture classic, Tron #1 takes place in present day, over two decades after the events of the film. Jet Bradley, son of the original Tron programmer Alan Bradley, has recently escaped the computer world. But his experiences within cyberspace have left him emotionally scarred - vivid nightmares plague him, and he's become paranoid and unstable. He shuns technology wherever possible, leaving him effectively crippled in the modern world. And now something within the computer world wants him back. Exploring the fast-paced action from the hit film and recent video game, plus the impact of experiencing the cyberworld on the human psyche, this series starts a thrilling new chapter in the Tron saga! By Landry Walker, Eric Jones, & Louis De Martinis.